Sarahan is a small town with greater religious importance. This place is associated to one of the 51 Shakti peeths i.e. the Bhimakali temple. The temple is a sight behold as the exterior of the temple boasts of intricate wood work and the interiors for its intricate carvings. 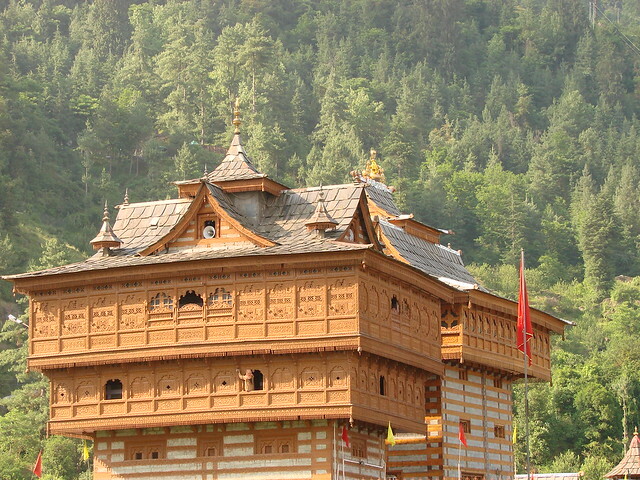 The temple of Bhimkali is associated to goddess Sati whose ear fell here after the Daksha Yagya incident. The temple complex has three more temples to admire and these are Patal Bhairav (the guardian of Shakti Peeth), Lord Raghunath and Narsingh. During festival of Dussera a grand prayers are performed at Bhimakali temple and villagers from alla round Sarahan visit this place. So Dussera is one of the best times to visit Sarahan & Bhimakali temple. Saharan acts as the base for many treks and is the gateway to Kinnaur. Sarahan is about 560 KMs from New Delhi & about 180 KMs from Shimla city. Tourists can take bus from Shimla or hire a taxi.